The ether is all around and in her mind. Hana's saga continues! Hana Gitelman was an Israeli Mossad Operative whose Mother and Grandmother were killed in the same suicide attack. Hana's lust for vengeance was the very thing that kept her out of the field and in the intelligence office. While she excelled at code-breaking, she yearned to fight in the battlefield. One day a man came with an opportunity to do just that. A man with Horn Rimmed Glasses. Hana discovered that she has a spectacular ability. 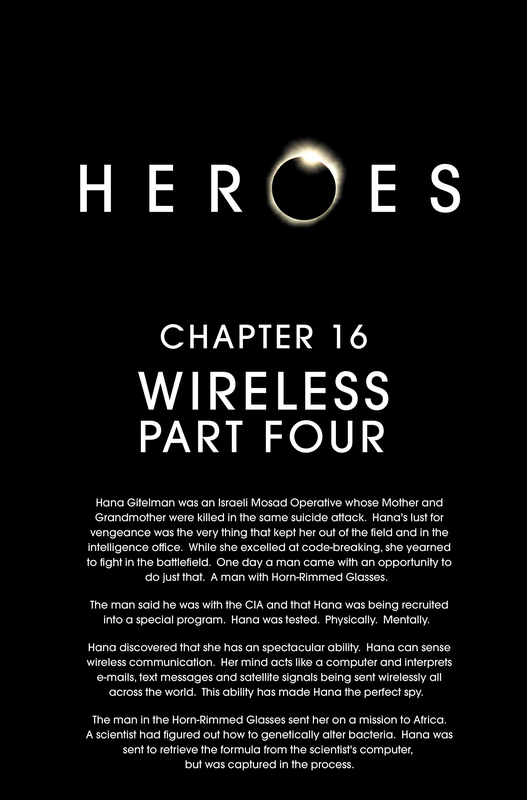 Hana can sense wireless communication. Her mind acts like a computer and interprets e-mails, text messages and satellite signals being sent wirelessly all across the world. This ability has made Hana the perfect spy. The man in the Horn-Rimmed Glasses sent her on a mission to Africa. A scientist had figured out how to genetically alter bacteria. Hana was sent to retrieve the formula from the scientist's computer, but was captured in the process. Trapped, Hana offers her CIA connection as a means of escaping through diplomacy. She is brought to the U.S. Embassy, where she learns Mr. Bennet lied to her about his organization. Hana uses the technology of the building to flee. She turns on the sprinklers, steals a gun, and holds an Embassy employee hostage, concluding in a spectacular escape. Hana finds refuge in the quiet, remote Missoula, Montana, where she searches for information about the man who lied to her. It was revealed in this comic that Hana has the Mark on her neck. While in Missoula, Montana, Hana reads an encrypted email that points her to somebody who seems to be aware of Mr. Bennet's whereabouts. The message is written in 1337 code. The Easter Egg cannot be accessed from the online version of the graphic novel. It can only be retrieved by manually typing in the URL. 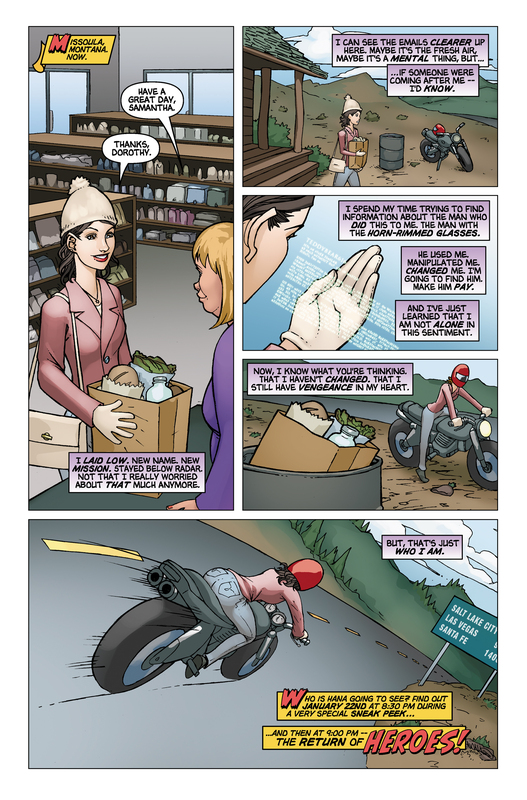 The last panel of the comic contains a teaser that the Hana character will be appearing on Heroes during a sneak airing before the new episode on Jan 22, 2007.
Who is Hana going to see? Find out January 22nd at 8:30 pm during a very special sneak peak ... and then at 9:00 pm -- the return of Heroes! For images from Wireless, Part 4, see images from Wireless, Part 4.